My girlfriend dragged me to the Fan Days Con in Plano, TX today. I’m glad she did. 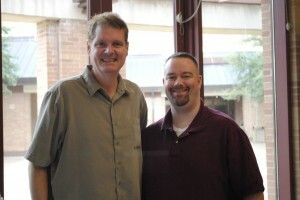 I got to meet this guy named Tom Kane. You know him as the voice of Yoda, Admiral Yularin, and the intro announcer on Star Wars: The Clone Wars. He’s also the voice of Vandar Tokare from KOTOR. When I asked if we might see our little green friend Vandar in TOR, he playfully said “Maaaayyyybeee” with a big grin on his face. He also told me about an unreleased character he’s voicing. He couldn’t give me the name, but he said he’s a cyborg type character, aligned with the Republic. Apparently, the inspiration for this character’s voice was Charlton Heston. I’ll definitely be on the look out for that character, as I love Tom’s work. He talked about the amazing breadth of the voice over. He said, even the 5 or 6 minor characters he voiced “had scripts like this.” As he held up his fingers and made a two inch gap between his thumb and index finger. Here’s a picture of us taken by my girlfriend Erin, she’s so good at photography, she makes me look good! Click here for another picture of Xavier with an Imperial guard. Thanks for the great report, Xavier. Sounds like we’ll be seeing him in TOR, terrific scoop!